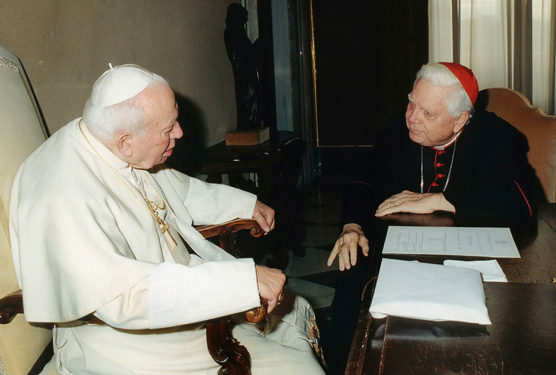 Cardinal Bernard F. Law, who had been one of the United States’ most powerful and respected bishops until his legacy was blemished by the devastating sexual abuse of minors by priests in his Archdiocese of Boston, died early Dec. 20 in Rome at the age of 86. Before the abuse scandal forced his resignation in 2002, Cardinal Law had been a leading church spokesman on issues ranging from civil rights to international justice, from abortion to poverty, from Catholic-Jewish relations and ecumenism to war and peace. Cardinal O’Malley said Cardinal Law would be buried in Rome, where he had his last assignment. According to the Vatican, his funeral Mass was to be celebrated the afternoon of Dec. 21 in St. Peter’s Basilica with Cardinal Angelo Sodano, dean of the College of Cardinals, presiding. Pope Francis, as is customary for cardinals’ funerals, was to preside over the final rites at the end of Mass. In a brief telegram to Cardinal Sodano, Pope Francis extended his condolences to the College of Cardinals, Pope Francis said, “I raise prayers for the repose of his soul that the Lord God, who is rich in mercy, may welcome him in his eternal peace, and I send my apostolic blessing to those who share in mourning the passing of the cardinal, whom I entrust to the maternal intercession of the Virgin Mary Salus Populi Romani,” the title with which she is honored at Rome’s Basilica of St. Mary Major. Bernard Francis Law was born on Nov. 4, 1931, in Torreon, Mexico, where his father, a career Air Force officer, was then stationed. He attended schools in New York, Florida, Georgia, and Barranquilla, Colombia, and graduated from Charlotte Amalie High School in St. Thomas, Virgin Islands. He graduated from Harvard University in Cambridge, Massachusetts, before entering St. Joseph Seminary in St. Benedict, Louisiana in 1953. He later studied at the Pontifical College Josephinum in Worthington, Ohio. He was ordained a priest of the Diocese of Natchez-Jackson (now Jackson), Mississippi, in 1961. After serving two years as an assistant pastor, he was made editor of the Mississippi Register, the diocesan newspaper. At the same time, he held several other diocesan posts, including director of the family life bureau and spiritual director at the minor seminary. A civil rights activist, he joined the Mississippi Leadership Conference and Mississippi Human Relations Council. He received death threats for his strong editorial positions on civil rights in the Mississippi Register. His work for ecumenism in the Deep South in the 1960s received national attention, and in 1968 he was tapped for his first national post, as executive director of the U.S. bishops’ Secretariat for Ecumenical and Interreligious Affairs. In 1973 Blessed Paul VI named him bishop of Springfield-Cape Girardeau, Missouri. He made headlines in 1975 when, amid an influx of Vietnamese refugees arriving in the United States, he arranged to resettle in his diocese all 166 refugee members of the Vietnamese religious order, Congregation of the Mother Co-Redemptrix. Continuing his ecumenical work, he formed the Missouri Christian Leadership Conference. He was made a member of the Vatican’s Secretariat (now Pontifical Council) for Promoting Christian Unity and served in 1976-81 as a consultor to its Commission for Religious Relations with the Jews. He also chaired the U.S. bishops’ Committee on Ecumenical and Interreligious Affairs in the late 1970s. In 1981, when the Vatican Congregation for the Doctrine of the Faith approved a special program for welcoming into the Catholic priesthood former U.S. Episcopalian priests who became Catholics, he was named the Vatican delegate to develop the program and oversee it. In the program’s first year 64 former Episcopalian priests applied for acceptance. St. John Paul II made him archbishop of Boston in January 1984 and the following year made him a cardinal. Soon after his arrival in Boston, Cardinal Law became well-known for his work for immigrants and minorities. 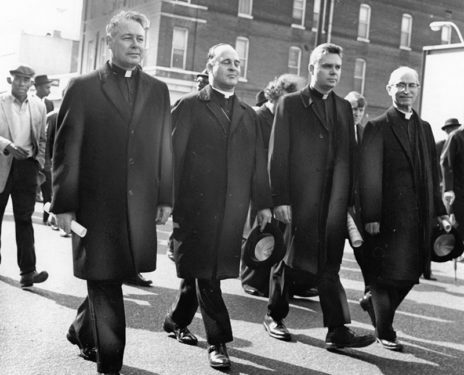 He often led the Massachusetts bishops in struggles to maintain or increase funding for programs for the poor and most vulnerable segments of the population and in the fight against abortion and the death penalty. A constant advocate of the right to life of the unborn, he denounced the pro-abortion stance of the Democratic vice presidential candidate, Geraldine Ferraro, a Catholic, during the 1984 presidential race. While he called abortion “the critical issue of the moment,” in 1995 he urged a moratorium on abortion clinic protests after a gunman attacked two Boston clinics, killing two people and wounding five. It was his proposal for a worldwide catechism, in a speech at the 1985 extraordinary Synod of Bishops, that led to development of the “Catechism of the Catholic Church.” Cardinal Law also oversaw the first drafting of an English translation of the catechism — and unsuccessfully defended the inclusive-language version that the Vatican ultimately rejected and ordered rewritten. 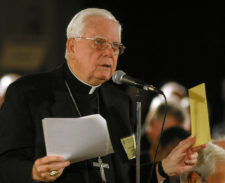 The collapse of Cardinal Law’s authority and status began in January 2002 with the criminal trial of serial child molester John Geoghan and the court-ordered release of archdiocesan files on Geoghan to the media. Geoghan had been allowed to stay in active ministry for three decades before he was finally removed and subsequently laicized. The released files showed that when complaints against Geoghan were made in one parish he would be removed, but soon assigned to another parish. The files gave firsthand proof of how such complaints were handled and demonstrated a pattern of protecting and transferring abusive priests by the cardinal and his aides. In the first weeks following the revelations, Cardinal Law publicly apologized on several occasions and announced a series of major policy changes — most importantly, removing permanently from ministry any priest ever credibly accused of sexual abuse of a minor and turning over to district attorneys the names of all priests against whom any abuse allegation had been made. A series of investigative reports on the issue by the Boston Globe made national headlines and other newspapers and television news teams across the nation began investigating how their local dioceses dealt with abusive priests. At the time of his resignation from the Boston Archdiocese, Cardinal Law was 71 years old and, as a cardinal since 1985, the senior member of the U.S. Catholic hierarchy. His resignation did not affect his standing as an active cardinal. He retained membership on several Vatican congregations and, before he turned 80, he entered the 2005 conclave that elected Pope Benedict XVI. St. John Paul appointed Cardinal Law in 2004 to be the new archpriest of the Basilica of St. Mary Major, one of the four major basilicas of Rome. While he oversaw the administration and liturgical life of the basilica until his retirement in 2011, he kept a relatively low profile in the city. His death leaves the College of Cardinals with 216 members, including 120 cardinals who are under the age of 80 and eligible to vote in a conclave to elect a new pope.